This entire paragraph is misleading and blatantly false. I have never stated on October 18 or at any time that “the UBID water system is always above.1” and Haraldson’s definition of NTU’s as “(Clarity of Water)” is absolutely incorrect. 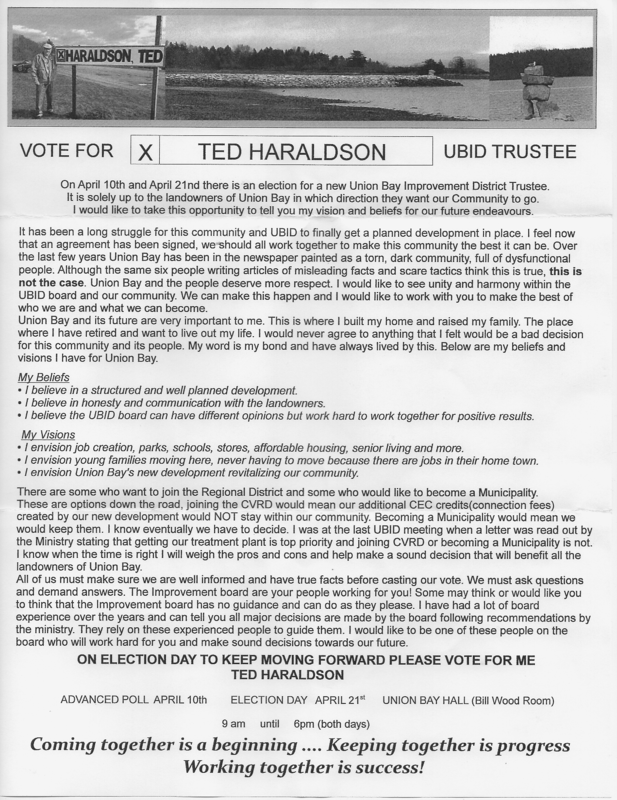 Chair Ted Haraldson has made falsestatements in writing to all of Union Bay before. I recall Haraldson’s very incorrect statement that “joining with the CVRD means losing some of our CEC money” this statement has been proven absolutely false. Joining the CVRD would mean all monies collected by Union Bay including CEC’s stays in Union Bay’s accounts, the CVRD can not touch it! Joining also means we would be entitled to infrastructure grants and municipal financing to the tune of 75 to 80 percent! Both Cumberland and CVRD have to build water treatment plants and are borrowing very little money because they receive subsidies and financing which we, being an improvement district, are not entitled to. Instead we will be paying close to 2 million in interest rates costs alone. (if we borrow 4 million) This is a huge waste of landowners money! Why is the threshold of greater than 1.0 NTU’s an important measurement? In Union Bay our drinking water comes from Langley Lake, this water is both unfiltered and untreated. To remedy this VIHA has mandated that Union Bay build a water treatment plant. Meanwhile and based on UBID’s Public Works Reports water from Langley Lake shows measurements greater that 1.0 NTU’s regularly, some examples, Jan. 2017- 2.9 NTU’s and Feb. 2017 2.3 NTU’s. These higher readings of turbidity usually occur in winter months and the high turbidity readings happen every year. The 2013 Ministry Turbidity Tree is used to help in determining if a ‘boil water advisory’ should be issued. Turbidity is defined as “suspended and colloidal particles and/or microscopic organisms.” which may or may not be harmful to human health. I believe it is false and misleading to imply that Union Bay has quality water and thereby safe since “we have never had a boil water order in 40 years.” This is a logical fallacy and demonstrates the Board Majority’s lack of understanding and lack of competence in potable water management. It should be of concern to Landowners when UBID provides false definitions of technical terms (NTU’s). The true “quality” of drinking water can only be accurately determined by expensive and time consuming lab tests, something no community can afford to do on a regular basis including Union Bay. The truth (based on scientific evidence) is we really don’t really know how ‘safe’ our drinking water is. What we do know is that it is currently unfiltered and untreated (other than chlorine) and it comes from a small spring fed boggy lake. There is a lot of brown sludge in our water as well, as evidenced by the scum you have to remove from any pot or kettle used to regularly boil water in. This adds an additional layer of processing needed via settling ponds to remove this sediment. So far the Public Works Report on this matter has not been forthcoming, and it has been 4 months since the motion was passed. Where is this report? VIHA has been very clear that Union Bay is responsible to landowners with regards to our drinking water and UBID must provide this information, several landowners have requested this information and have been ignored. I was ordered to leave the October 18, 2018 Board Meeting for asking about the missing Public Works Report which should have been included as part of the September UBID Board minutes. I was recognized by the Chair as I had a question about the missing report. Despite having the floor I was repeatedly interrupted by other Trustees. It must be stated that Chair Haraldson routinely allows others to interrupt and interject which is a form of harassment and a suppression of political speech. I was asking for the whereabouts of a water report the Board unanimously requested in June Board meeting. There was nothing inappropriate with my question. Ordering me to leave the meeting was inappropriate and unnecessary. Not providing a response with regards to the missing Water Report which is supposed to explain what UBID has done in the past when water measured from Langley Lake indicates greater than 1.0 NTU’s is unreasonable and undemocratic and possibly unsafe! As I have done for over a decade I will continue to boil my water. In summer I have drinking water delivered. The fact is our current drinking water is both unfiltered and untreated (other than chlorine) and remains so until the treatment plant is functional. 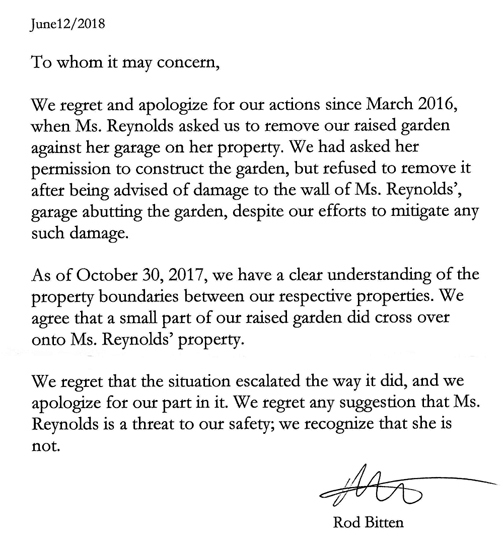 Instead of sending “safety letters” designed to malign a Trustee, UBID needs to provide accurate information based on facts and evidence on its water management. Providing a thorough water report written by our Public works Superintendent explaining what specifically UBID does when NTU’s are greater than 1.0 including what extra testing is done and what are these tests measuring would be a necessary first step restoring public trust and accountability. This report should be simple and straight forward for the superintendent to prepare. The superintendent does all the testing and keeps records. It is our water after all and we have a right to kn0w what UBID does when NTU readings are greater than 1.0 NTU’s. Winter is approaching and the time for increased turbidity is coming.